PĀPAʻIKOU, Hawaiʻi - Customers from Maluna Place and north along Old Māmalahoa Highway, and all side roads, will experience no water until repairs can be made. 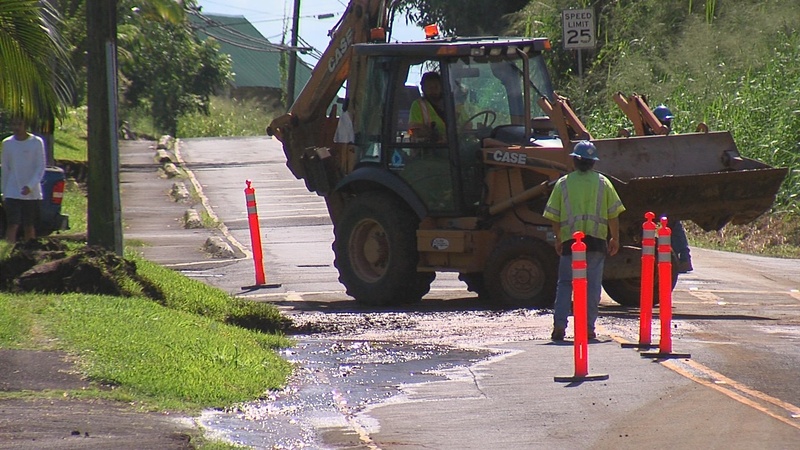 Crews work on the water main break in Pāpaʻikou. UPDATE (4 p.m.) – Repairs were completed at 3:30 p.m. to a water main break near Pāpaʻikou Gym, restoring water service to customers in Pāpaʻikou from Maluna Place and north along Old Māmalahoa Highway, the Department of Water Supply says. Department of Education reports Prince Jonah Kuhio Kalaniana’ole Elementary and Intermediate School will reopen and resume school tomorrow (November 14), reported Hawaiʻi County Civil Defense. (BIVN) – A water main break near Pāpaʻikou Gym left area customers – and public school – without water on Tuesday morning. According to the Hawaiʻi County Department of Water Supply, Pāpaʻikou customers are without water from Maluna Place and north along Old Māmalahoa Highway (also known as Scenic Road), and all side roads including but not limited to Kaʻapoko Homesteads and Prince Jonah Kūhiō Kalanianaʻole Elementary and Intermediate School. Water Supply personnel are working to fix the water main break and repairs are estimated to be completed by this evening. Water Supply says it will be installing a spigot for public access at the intersection of Old Māmalahoa Highway and Maluna Place. “Please call (808) 961-8060 during normal business hours, (808) 961-8790 for after-hour emergencies, or email: dws@hawaiidws.org,” a Water Supply message stated. An August 31 water main break in Pāpaʻikou also closed the school. On August 28, the county announced that inclement weather associated with Hurricane Lane “caused damage to portions of our Pāpaʻikou infrastructure, causing interruptions in water service.” The Department of Water Supply was hauling water to maintain water service. At that time, water officials requested Papa‘ikou customers reduce daily water usage by 10% in order to maintain service to all.